The Pied Piper of Hamelin, Robin Hood (Nottingham/England) and Wilhelm Tell from Switzerland created the Alliance “Legion of Legends” and meet on special occasions. From the 21st to 23rd of July 2017, the legends met in Switzerland by Lucerne at the Lucerne Lake and thus closed the circle. There, where the Swiss Confederation was sworn. But more important were the renewed communion and intercultural exchange. “Legion of Legends” will continue to grow, according to plans. Scotland’s Braveheart, France’s Joan of Arc and Spain’s Don Quixote are also candidates. The idea: to organize regular meetings and, symbolically, to demonstrate a picture of the history of the important legends of the European continent. The first day of the long weekend with tell and his friends was a good day: a warm welcome to the town Hall of Schwyz, an interesting tour through the Federal Archives, an eventful visit of the Schuler St. Jakobs-Winery in Schwyz with its cooperage and the impressive wine cellar full of wooden barrels. On the second day it was a ride with a steam-boat to Rütli, where the legends swore “their” Rütli oath and then continued the tour with many Fan encounters on the Lucerne Lake incl. Uri to Lucerne, where the Kanton Council president was waiting for them. In Lucene the “bear danced,” photo shootings were spontaneously called at every corner. Gesslers end, the Hollow Way was the final goal. Sunday, the last day, it was off to the Goldau Zoo, followed by the Rigi Cog Railway on a surprising ride to the mountaintop. On the return they visited in Gersau the unique crossbow workshop of “Tell”. The participants: The Pied Piper of Hamelin starring Michael Boyer, from Nottingham Tim Pollard (Robin Hood), Robert Sim (Evil Sheriff) and councilwoman Jackie Morris and from Switzerland, Sepp Steiner (Wilhelm Tell), Christian Detterbeck (Vogt Gessler) were supported by the three Swiss guardsmen Marco Pögen, Armin Nideröst and Bruno Fanchini, as well as Hedwig Zangger, the assistant and partner of Sepp Steiner. Arrival on Thursday wetting the dry throats during a briefing at the Brunner Hof-Bar then on to quarters at City-Hotel. 1st day start: The Swiss Guard has found itself in its traditional garb, from head to toe red with a white cross on the chest, with halberd, sword and a metal helmet. As a surprise from the hired Taxi Company, the “Legion of Legends” rode a white stretch limousine with the guard to the Schwyz wine shop Schuler, operated in the 11th Generation and 325 years old. A champagne reception with a snack and a kl. Tasting of wines was prepared and festive. In the connected Cooperage was demonstrated to the guests how a wooden barrel is formed. The legends immortalized themselves on the freshly branded cask and during the guided tour of the wine cellar there was a spontaneous, moody photoshooting in front of giant wooden barrels. The tell workshop is moving to the site of the wine shop, so that the survival of the medieval workshop is secure. Just like a good wine, Tell-Workshop-Director Sepp Steiner himself has aged well and rejoices over the continuance with the wine-shop Schuler. 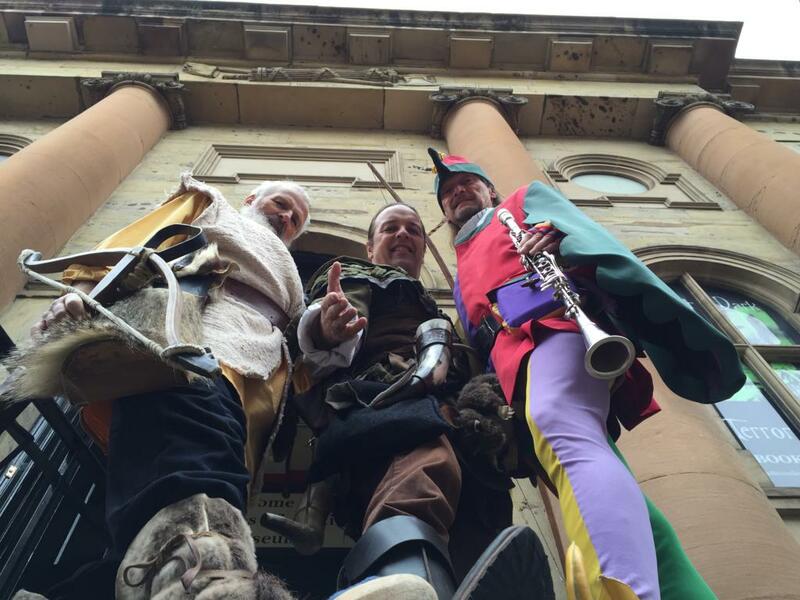 In front of the Federal Letter Museum, the central document Archive of Switzerland, in which the federation certificate of 1291 is kept with the original oath, the legends were received “befittingly” on the gallery with two alphorns. In the city hall of Schwyz the Legionnaires were received by tourists, politicians and press representatives, including the municipal president, Xaver Schuler. In the boardroom, The Pied Piper, Robin Hood, Nottingham’s Sheriff, Wilhelm Tell and Gessler, played their story to the exclusive audience. In addition, Nottingham’s councilwoman Jackie Morris broke a lance for the cultural association and the sustainable expansion and consolidation of the Legion of Legions. Afterwards, the excursion to Schwanau, a local venue in a castle complex and lookout tower with a view of the Rigi on a small island in the Lauerzer Lake, which can only be reached with a transfer boat. There, magnificent panoramic images were created in front of and behind the camera and the asparagus soup was delightfully served in a liquor glass and other refined dishes were praised by all as very tasty. On the second day, the legends travelled with a 100 year old paddle-wheel steamer over the Lucerne Lake on a course to the Rütli and went uphill to the place where the oath was supposed to have taken place in the cloak of darkness 710 years ago. The guard called to formation and then “attention” followed the great moment: There the legends each gave a vow to their Union of the “Legion of Legends”in their national language . A little above the “Schworplatz” lies the Rütli Meadow. The meadow belongs to all children of Switzerland (no State property). There is also a guesthouse where a panoramic view of the “Mythen” can be seen. “Hornkühe” on the hillside and secluded places among many trees contribute to the perfect idyll. Almost all Swiss children go to the meadow in their schooling, just like almost all Lower Saxony children visit the Pied Piper in Hamelin. On the next leg, it was past the Tell plate. There, he is to have lept from the boat to the shore and thus escaped the Reeve Gessler and regained his freedom. On a chapel there on the shore, the event is depicted on frecsos. In Lucerne, the delegation at the boat jetty was already expected by the Canton Council President, Vroni Thalmann-Bieri, and escorted her through the port city, which is bordered by the shore of many small shops and gastronomic venues. A winding river bridge and promenade with a pretty baroque old town directly on the Reuss and Lucerne Lake, explain why many Asian guests find their way into this town. The evening ended with the visit of the Council cellar with an attached brewery – where even the visit to the toilet becomes a pleasant experience – the way leads through a magnificent courtyard. The houses were built around 1500. The Legends survived the crowd diving and the relentless photo attacks were parlayed with dignity. On the return, halt was made at the “Hollow Alley” where Tell of the saga killed Gessler. Like the Rüti Meadow, this place has also been awarded to the children of Switzerland. The alley was returned to its original state, a modern layer had to be removed. To finance the action, children had to bring 20 Rappen to school. Result: a barbecue area and a play area as well as a roofed information room were created. On the third day, the Legends travelled to Goldau Botanical Zoo, which was created on a landslide site. The site has been largely preserved and only animals indigenous in the region are preserved in the zoological garden. The mountain avalanched 1806 and had buried an entire village with over 400 people. Finally on foot, the path continued to the Rigi Valley station, where train attendant Hanspeter Gloor disguised as a historian of the traditional Rigi railway already waited. A richly decorated Book of the year 1600 under his arm (we keep ours chilled behind glass in museums) with wood carving, rivets and gold edges, he greeted the comers heartily. The cog railway was put into operation for the first time 1871. With an incline of 19.4 percent or 1940 promille, the train runs up to 1800 meters. In the direction of Vitznau, it is 25 percent incline. The Rigi-Bahners wanted to celebrate the trip with the Legion of Legends, and they succeeded: at the stop on the mountain station they hung a classic old saloon car on and a “Baroness,” Carmen Brecht, hosted the guests. Pouring drinks at an angle is somewhat adventurous and not to be taken lightly, but nothing spilled from the special skewed glasses on board. The only drop of melancholy: The Rigi was fogged in that day. Later Tell, alias Sepp Steiner, opened his Tell’schen Crossbow Workshop: In addition to the ancient construction of crossbows, which he produces in an old-fashioned method, he demonstrated informatively and entertaining a medieval hand-lathe, a hand-drill and a rope-machine that were able to be tried out. At the end, Tell had gifts for the guests: He passed out wooden cutting boards with a carved Rigi Mountain panorama and Swiss knives, as well as local salami and hand-woven towels with a Wilhelm Tell motif from a Gersau partner. Vendelin Coray, tourism chief of the canton of Schwyz, praised Christian Detterbeck for the successful preparation of the Legends Weekend program and will use it as a basis for a Tell tour for the tourists. “This emotional experience of Switzerland can really only be experienced perfectly in central Switzerland”, concluded Tell’s assistant Hedwig Zangger. The Legion of Legions separated at the Gersau Country Inn “Tübli” in peace and friendship. Reeve Gessler was so moved and reformed that he gladly paid the host with a full sack of “Free Gersau Gulden”. Previously: Rat-catcher actor Michael Boyer and Wilhelm Tell alias Sepp Steiner visited Nottingham/England for the first time 2015 to celebrate the “Robin Hood Day” with Robin Hood, portrayed by Tim Pollard. The next union was at “Hameln Pfeifer Day” (exodus of the Children of Hameln 26. June 1284) in the context of Grimm Jubilee celebrations (#sagenhaft – 200 years of German legends of the Brothers Grimm) in Hamelin 2016. The legend of Wilhelm Tell is also recorded by the Grimms in the 2nd volume, that appeared in 1818, so that the Swiss have another occasion to celebrate with their national hero in 2018. In the Tell Legend, he had to shoot the fruit from the head of his son in the pure chicanery of Reeve Gessler in the year 1307 (according to Tschudi «Chronicon Helveticum»). Wilhelm Tell starring Sepp Steiner is a passionate tinkerer and has constructed an apparatus in a wooden box that, at the right moment, bolts an arrow through an apple from within. He uses a 450-year-old crossbow with a hand-carved wooden arrow of lichen-like winds for the “Apple shot”. The tall Swiss with Beard works voluntarily in the medieval workshop in Gersau near Lucerne on the Lucerne Lake. There he offers guided tours on the topic of Wilhelm Tell. Der Rattenfänger von Hameln, Robin Hood (Nottingham/England) und Wilhelm Tell aus der Schweiz sind das Bündnis „Legion of Legends“ eingegangen und treffen sich zu besonderen Anlässen. Vom 21. – 23. Juli 2017 trafen die Legenden sich in der Schweiz bei Luzern am Vierwaldstätter See und damit schloss sich der Kreis. Dort wurde der Rütlischwur, zum 710. Mal begangen, der den Dreh- und Angelpunkt der Tell`schen Sage markiert und den berühmten „Apfelschuss“ hervorgerufen hat. Doch vordergründiger waren die erneute Gemeinschaft und der interkulturelle Austausch. „Legion of Legends“ soll weiter wachsen, so der Wunsch. Schottlands Braveheart, Frankreichs Jeanne D’Arc und Spaniens Don Quixote sind dabei u.v.a. Kandidaten. Die Idee: regelmäßige Treffen zu organisieren und dabei symbolisch ein Bild der Historie der starken Legenden des europäischen Kontinents zu demonstrieren. Das lange Wochenende mit Tell und seinen Freunden war eine bereichernde Zeit: ein herzliches Willkommen im Rathaus Schwyz, ein interessanter Rundgang durchs Bundesbriefarchiv und ein erlebnisreicher Besuch der Schuler St. Jakobs-Kellerei in Schwyz mit Besichtigung ihrer Fass-Küferei und dem eindrucksvollen Weinkeller. Am zweiten Tag ging es auf Fahrt mit einem Rad-Dampfschiff nach Rütli, die Legenden leisteten dort „ihren“ Rütli-Schwur und setzten danach die Rundfahrt mit vielen Fanbegegnungen auf dem Vierwaldstätter See inkl. Urnersee nach Luzern fort, wo schon die Kanton Ratspräsidentin auf sie wartete. In Luzern tobte der Bär und Foto-Shooting war an jeder Ecke angesagt. Außerdem wurde die berühmte „Hohle Gasse“ besucht. Sonntag, den letzten Tag, ging es in den Goldauer Tierpark und im Anschluss mit der Rigi-Zahnradbahn auf eine überraschende Fahrt. Auf dem Rückweg besuchten sie in Gersau die einzigartige Armbrust-Werkstatt des „Tell“. Am Wochenend-Treffen nahmen teil: Aus Hameln Rattenfänger-Darsteller Michael Boyer, aus Nottingham Tim Pollard (Robin Hood), Robert Sim (böser Sheriff) und Ratsfrau Jackie Morris und aus der Schweiz dabei waren Sepp Steiner (Wilhelm Tell), Christian Detterbeck (Landvogt Geßler) unterstützt von den drei Schweizer Gardisten Marco Pögen, Armin Nideröst und Bruno Fanchini sowie Hedwig Zangger, die Assistentin und Lebensgefährtin von Sepp Steiner. Anreise Donnerstag Brunnen mit Willkommens- Apero im Brunner Hof-Bar und Lagebesprechung im Quartier, im City-Hotel. Erster Tag Start: Die Schweizer Garde hat sich in Ihrer traditionellen Kluft eingefunden, von Kopf bis Fuß rot mit einem weißen Kreuz auf der Brust, mit Hellebarde, Schwert und einem metallenem Helm. Als Überraschung von dem geordertem Taxi-Unternehmen wurden die „Legion of Legends“ in einer weißen Stretch-Limousine samt Garde vom Hotel zur Schwyzer Weinhandlung Schuler gefahren. Diese wird in 11. Generation geführt und ist mittlerweile 325 Jahre alt. Ein Sekt-Empfang mit anschließendem Snack und einer kl. Kostprobe von Weinen war vorbereitet und festlich durchgeführt worden. In der angeschlossenen Küferei wurde den Gästen demonstriert, wie ein Holzfass entsteht. Die Legenden verewigten sich auf dem frisch gebrandeten Fass und bei der Besichtigung des Weinkellers gab es spontan im schummerigen Licht, vor Riesen-Holzfässern ein Fotoshooting. Die Tell-Werkstatt siedelt gerade auf das Gelände der Weinhandlung um. Hintergrund ist, dass der Fortbestand der mittelalterlichen Werkstatt gesichert werden soll. Denn wie ein guter Wein ist mittlerweile Tell-Werkstatt-Leiter Sepp Steiner selbst in besten Jahren und freut sich über den Fortbestand durch die Weinhandlung Schuler. Vor dem Bundesbrief-Museum, das zentrale Dokumentenarchiv, in dem der Bundesbrief von 1291 mit dem Original-Rütlischwur aufbewahrt wird, wurden die Legenden „standesgemäß“ auf der Treppen-Empore von zwei Alphorn-Bläsern empfangen. Im Rathaus von Schwyz wurden die Legionärs von Regierungsrat Andreas Barraud und André Rüegsegger, von Touristikern sowie Pressevertretern empfangen, auch der Gemeinde-Präsident, Xaver Schuler, war anwesend. Im Festsaal spielten anschließend der Rattenfänger, Robin Hood, Nottinghams Sheriff, Wilhelm Tell und Geßler dem ausgewähltem Publikum ihre Geschichte vor. Im Weiteren brach Nottinghams Ratsfrau Jackie Morris eine Lanze für die kulturelle Vereinigung sowie für die nachhaltige Erweiterung und Festigung der „Legion of Legions“. Zum Ausklang des ersten Tages folgte die Fahrt nach Schwanau, einem Ausflugslokal in einer Burganlage und Aussichtsturm mit Blick auf den Rigi auf einer kleinen Insel im Lauerzer See, welches nur mit einem Transfer-Boot erreicht werden kann. Dort entstanden herrliche Panoramabilder vor und hinter der Kamera – und die Spargelsuppe, entzückend in einem Schnapsglas serviert, samt weiterer raffinierter Gerichte wurden von allen als sehr wohlschmeckend gelobt. Am zweiten Tag fuhren die Legenden mit einem über 100 Jahre alten Raddampfer über den Vierwaldstätter See mit Kurs zum Rütli und gingen bergan zu dem Platz, wo der Rütlischwur vor 710 Jahren im Mantel der Dunkelheit stattgefunden haben soll. Die Garde rief zur Formation auf und dann „Attention“ folgte der große Moment: dort leisteten die Legenden nun jeweils in ihrer Landessprache den Schwur auf die Vereinigung der „Legion of Legends“. Etwas oberhalb des Platzes liegt die Rütli-Wiese. Die Wiese gehört allen Kindern der Schweiz (kein Staats-Eigentum). Dort ist auch ein Gasthof mit Panoramablick auf die „Mythen“ zu finden. Hornkühe am Hang und lauschige Plätze unter vielen Bäumen tragen hier zu der perfekten Idylle bei. Nahezu alle Schweizer Kinder fahren in ihrem Schulleben einmal mit der Klasse zu der Wiese, ähnlich wie nahezu alle niedersächsischen Kinder mal den Rattenfänger in Hameln besuchen. Auf der Weiterfahrt ging es auch an der Tell-Platte vorbei. Dort soll er der Sage nach vom Boot auf das Ufer gesprungen sein und dadurch dem Landvogt Geßler entgangen und seine Freiheit wieder erlangt haben. An einer Kapelle am Ufer wird die Begebenheit auf Bildern dargestellt. In Luzern wurde die Delegation am Bootsanleger schon von der Kanton-Ratspräsidentin, Vroni Thalmann-Bieri, erwartet und ging mit Ihnen durch die Hafen-City, die am Uferrand gesäumt ist von vielen kleinen Geschäften und gastronomischen Einrichtungen. Eine verwinkelte Flussbrücke und Promenade mit hübscher barocker Altstadt direkt an der Reuss und dem Vierwaldstätter See, erklären warum viele asiatische Gäste den Weg in dieses Städtchen finden. Der Abend endete mit dem Besuch des Ratskellers mit angeschlossener Brauerei – wo sogar der Gang zur Toilette zum angenehmen Erlebnis wird – der Weg führt durch einen prachtvollen Hinterhof. Die Häuser sind um 1500 entstanden. Das Bad in der Menge genossen die Legenden sichtlich und allen Foto-Attacken hielten sie würdevoll Stand. Auf der Rücktour wurde halt an der „Hohlen Gasse“ gemacht, wo der Tell der Sage nach den Geßler tötete. Wie die Rütli-Wiese ist auch dieser Ort den Kindern der Schweiz zugesprochen worden. Die Gasse wurde wieder in ihren Ursprung versetzt, dazu musste eine moderne Schicht abgetragen werden – zur Finanzierung der Maßnahme mussten vor Zeiten dafür Kinder 20 Gulden in die Schule mitbringen. Schließlich wurden ein Grillplatz und eine Spielwiese sowie ein überdachter Informationsraum angelegt. Am dritten Tag waren die Legenden in Goldau in einem Tierpark unterwegs, der in einem Bergsturz-Gelände angelegt wurde. Das Gelände wurde weitestgehend so belassen und ausschließlich in der Region lebende Tiere werden im Tiergarten gehegt. Der Berg war 1806 abgegangen und hatte damals ein ganzes Dorf mit über 400 Menschen unter sich begraben. Es ging zu Fuß weiter zur Rigi-Talstation wo schon Zugbegleiter Hanspeter Gloor verkleidet als Geschichtsschreiber der traditionellen Rigi-Bahn wartete. Ein reich verziertes Schreibbuch des Jahres 1600 unter dem Arm (bei uns liegt so etwas gekühlt hinter Glas) mit Holzschnitzerei, Nieten und Goldrändern, begrüßte er die Ankömmlinge aufs Herzlichste. Die Zahnradbahn wurde das erste Mal 1871 in Betrieb genommen. Mit einer Steigung von 19,4 Prozent oder 1940 Promille fährt die Bahn auf 1800 Meter hinauf. Richtung Viznau sind es streckenweise 25 Prozent. Die Rigi-Bahner wollten die Fahrt mit den Legion of Legends zelebrieren und das gelang Ihnen: Bei dem Halt auf der Bergstation hingen sie einen klassischen alten Salonwagen an und eine „Baroness“, Carmen Brecht, bewirtete die Gäste. Wenn in der Schieflage auch das Einschenken der Getränke etwas abenteuerlich war, so schwappte aus den speziellen schiefen Gläsern nichts über. Einziger Wehmutstropfen: Der Rigi hing an diesem Tag im Nebel. Später bat noch Tell, alias Sepp Steiner, rein in seine gute Stube, der Tellschen Armbrust-Werkstatt: Neben dem altertümlichen Bau von Armbrüsten, die von ihm in altmodischer Methode hergestellt werden, demonstrierte er Informativ und unterhaltsam eine Hand-Drechselbank, einen Hand-Bohrer und eine Seil–Maschine aus der Zeit des Mittelalters. Zum Abschluss hatte Tell Geschenke für die Gäste: Er überreichte Schneidebretter aus Holz mit ausgeschnittenem Rigi-Panorama samt Schweizer Messer zudem lokale Salami und von einem Gersauer Partner handgewebte Handtücher mit eingewebten Wilhelm-Tell-Motiv. Vendelin Coray, Tourismuschef vom Kanton Schwyz, lobte Christian Detterbeck für die gelungene Ausarbeitung des Programms des Legenden-Wochenendes und wird es als Grundlage für eine Tell-Tour weiter verwenden. „Dieses emotionale Erleben der Schweiz kann wirklich nur perfekt in der zentralen Schweiz erlebt werden“, so abschließend Tells Assistentin Hedwig Zangger. Die Legion of Legions trennten sich im Gersauer Landgasthaus „Tübli“ in aller Freundschaft und gerne zahlte der „geläuterte“ Landvogt Geßler die Zeche mit einem vollen Sack freier Gersauer Gulden. Rattenfänger-Darsteller Michael Boyer und Wilhelm Tell alias Sepp Steiner waren erstmalig 2015 nach Nottingham/England gereist, um mit Robin Hood, dargestellt von Tim Pollard, den „Robin Hood Day“ zu feiern. Dann kam es am „Hamelner Pfeifer Tag“ (Auszug der Kinder zu Hameln 26. 6.1284) im Rahmen von Grimm-Jubiläums-Feierlichkeiten (#Sagenhaft 200 Jahre Deutsche Sagen der Brüder Grimm) 2016 in Hameln zum erneuten „meet and greet“ der weltbekannten Größen. Auch die Legende von Wilhelm Tell ist von den Grimms erfasst im 2. Band, der 1818 erschien, so dass die Schweizer mit ihrem Nationalheld 2018 einen weiteren Anlass zum Feiern haben. In der Tell-Sage ist es sein Sohn, dem er die Frucht vom Kopfe schießen musste – aus reiner Schikane des Landgrafen Geßlers im Jahre 1307 (Rütlischwur laut Tschudis «Chronicon Helveticum» ). Wilhelm Tell Darsteller Sepp Steiner ist passionierter Tüftler und hat eine Apparatur in einer Holz-Box konstruiert, die im richtigen Moment von innen einen Pfeil durch einen Apfel jagt. Er nutzt für den „Apfelschuss“ eine 450-Jahre alte Armbrust mit einem handgeschnitzten Holzpfeil der flechtenartigen Windungen hat. Der hochgewachsene Schweizer mit Rauschebart arbeitet ehrenamtlich in der mittelalterlichen Werkstatt in Gersau bei Luzern am Vierwaldstätter See. Dort bietet er auch Gästeführungen zum Thema Wilhelm Tell an.